At CigarsUnlimited.biz we offer one of the finest selections of retail and wholesale premium cigars, cigar bundles, pipes, humidors, cigar lighters, hygrometers and smoking accessories in the U.S.A.
John Monaghan is specified as the websites creator. The web server used by Cigarsunlimited.biz is located near the city of Wayne, USA and is run by 1&1 Internet. This web server runs a few other websites, mostly in the english language. 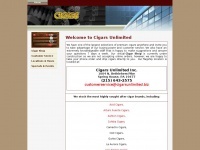 The websites of Cigarsunlimited.biz are served by a Apache server. The markup language of the website is HTML 4.01 Transitional. The website does not specify details about the inclusion of its content in search engines. For this reason the content will be included by search engines.